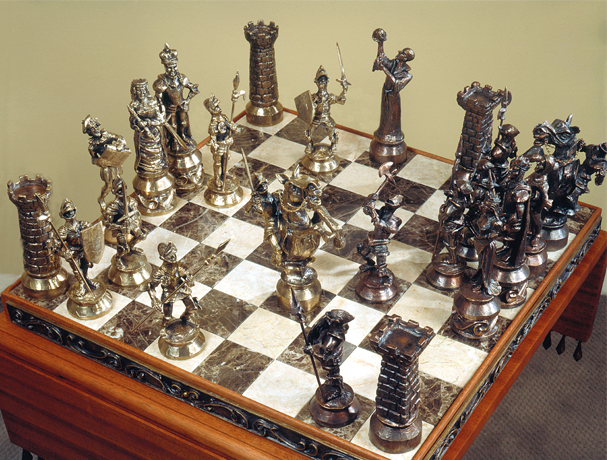 This extraordinary, intricately detailed bronze chess set rests upon its own idividually crafted table of marble, bronze and mahogany. Each one of the 32 pieces is unique, lending this work a level of unparalleled artisitic craftsmanship and beauty. This stunning bronze, is the artist’s statement on the human condition. “Who hasn’t felt at times like each one of these acrobats? Sometimes we struggle with what seems like the world’s weight on our shoulders. Then, in turn, like the figure in the middle, our course is to hold everything together. And, there are those rare and special moments when the world is in perfect balance, and we are on top.” The sculpture is mounted on a base of green marble & black walnut. The Fiddler, bow in mid-air, brings to life the sheer joy and fulfillment of soul that music universally embodies. 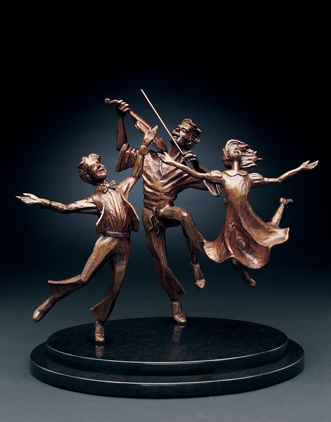 This uplifting sculpture is exquisitely crafted of cast bronze on a base of granite and walnut. A melodic line that sweeps and soars is reflected in the air-borne figures. This uplifting sculpture was created as an homage to music, an expression of joy. Created in cast bronze and mounted on black granite & black walnut. Movement, grace and exhilaration are captured in this work that combines classical form with contemporary subject matter. It is a striking portrait of the sheer happiness of love given and returned and a technical tour de force, created in cast bronze on a base of granite and walnut. This aptly titled work resounds with the reality that the human heart is filled and the spirit lifted when we love a child. This beautiful sculpture is crafted in cast bronze on a base of granite and walnut. "Wisdom is our gift to children. The carefree spirit of youth is their gift to us." This joyful sculpture, made of cast bronze on a granite and walnut base, exemplifies the love we share from generation to generation. This sculpture embodies movement, remarkable fluidity and elegance of line. It is energetic, joyful, and offers a glimpse of a special moment between two people that can only be described as an emotional grace note. Beautifully crafted of cast bronze on granite and walnut.